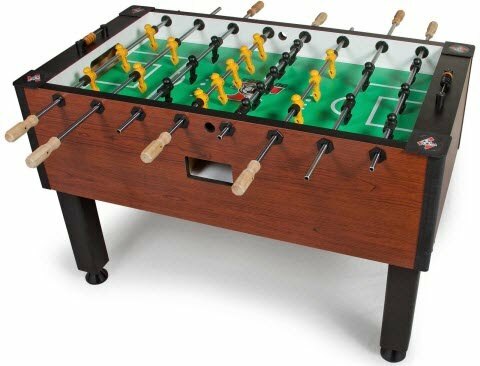 If you’re looking for one of the top foosball tables on the market today, get ready to choose a Tornado. The Tornado Elite is an excellent model at a decent price point, considering how expensive some of the professional Tornado models can be. Let’s dive into reviewing the Tornado Elite Foosball Table. The Tornado foosball table’s surface has a green color with black and yellow players. The Mahogany Melamine finish adds to its elegant and attractive appearance. For a more professional look, the legs are squared and black, with leg levelers for height adjustment, which is a nice added convenience. It’s an incredibly sturdy table that fits and goes with any game room. Tornado is the top foosball table brand, so it’s no wonder it looks as good as it plays. The build quality of the Tornado Elite foosball table is super premium. Some of the even higher end tables from this brand are popular tournament-level tables, and they’ve included many of those features into this model. The cabinet is 1-inch thick MDF wood that gives it a sturdy and durable performance. It’s also one of the few tables that’s actually made in the USA. Its MDF is the kind usually used with all tables, but the ones that fall in its price range are a higher grade material. It comes with a year’s warranty which can be an indicator that it will last you for a long time (considering some have warranties of only a couple months), and you can rely on its longevity. Durability is perhaps the greatest advantage of buying a Tornado (other than it’s exceptional playability, of course). The Tornado foosball table is 56 inches in length, 30 inches in width, and 36 inches in height. It weighs around 200 pounds. It’s not the most portable, as it’s one of the heaviest tables on the market, but it can be moved by 2 people. When you’re playing on the Tornado foosball table, you don’t have to worry about it swaying or budging as its heavy weight and sturdiness keep it grounded well. With the solid legs and quality leg levelers, you can go as hard as you want without having to worry about the table swaying and moving around. And let me just say that unless you’ve played on a Tornado, you have no idea what you’re missing. It’s just so, so good. The play field is very well made, super sleek, and very thick so you’ll always get an even, flat surface. The steel rods are made hollow to be lighter and thereby give you faster gameplay. This bodes well for experienced foosball enthusiasts. Plus, the amazing bearings add to the quick play style and will have your hands and arms feeling well rested even after a lengthy game. It has beautiful wooden handles to ensure that your hands don’t feel like they were molded to your hands. Thankfully this is one of the mid-level Tornado tables, which means it comes with counterbalanced men. Exactly what you’d expect if you’re spending this much on a table. The counterweighted foosball men allow you to move them out of the way for a long shot, without them falling back down and blocking your shot. The ball return is on the side, which means you never have to walk around to the end of the table, either, allowing for a fast and furious game. In terms of value for money, Tornado knocks this out of the park. If you need the counterweighted men, but don’t want to spend even more for a tournament table, this is about the best you can get in the “mid range” of Tornado’s offerings…which is still way higher quality than most “high end” tables. Perfect for extremely serious (or even professional) players, but will also treat beginners and younger players to an experience they didn’t know was possible. Tornado is a very reputable company, so even if you break off a leg on your table, you won’t find a hard time finding replacement parts because Tornado has you backed up on that point. To conclude, the Tornado Elite foosball table perfectly combines quality, reliability, and amazing gameplay. It would be a great addition to your game room, and it’s one of the highest quality recreational play tables on the market.